Adopted September 11, 2007 without dissent, again in 2009 without dissent, and on December 10, 2013 with 90.4% voting in favor. The members of the Downtown Residents Council (DRC) support the implementation of a streetcar system for the urban core. We believe a fixed rail transportation network will enhance the experience of visiting, living and working in the core of our city. Other cities implementing streetcar systems have seen good to great returns on their investment through new construction, new jobs, new business opportunities, enhanced quality of life and a cleaner city environment due to lessened automobile traffic. The DRC urges the City Council to support a program aimed at installing a fixed rail streetcar system within the boundaries of the Central Business District and Over the Rhine, which could possibly be expanded to the inner ring suburbs. Our members would greatly appreciate the ability to travel short distances from home and work on our lunch breaks, nights out, while running errands, shopping and entertaining friends. More transportation options will make it easier for modern families to live in the urban core by possibly removing the necessity of having multiple automobiles for personal mobility. This transportation option would also make the city more visitor-friendly by linking the many diverse shopping, dinning, entertainment, cultural and historic locations scattered throughout the valley. This entry was posted in Connect, Public Outreach and tagged Business News, Central Business District, Cincinnati, Downtown, Downtown Residents Council, Engagement, Livability, Opinion, Streetcar. Rail delivery on Elm Street (Findlay to McMicken). Elm Street will be closed from 11am-4pm. Rebar installation resumes on Elm Street, north of Findlay Market. Building wood forms for trackwork resumes north of Findlay Market, with concrete placement expected Jan. 2-3. Work resumes on traffic signals and poles for overhead power. Water main work resumes on Walnut & Main streets. Excavation for trackwork resumes at Findlay & Elm streets. This entry was posted in City of Cincinnati, Project Update, Revitalize and tagged Central Business District, Cincinnati, cincinnati bell, cincinnati water works, Construction, Downtown, duke energy, metropolitan sewer district, MOF, Over-the-Rhine, rail installation, sewer, Streetcar, utilities. 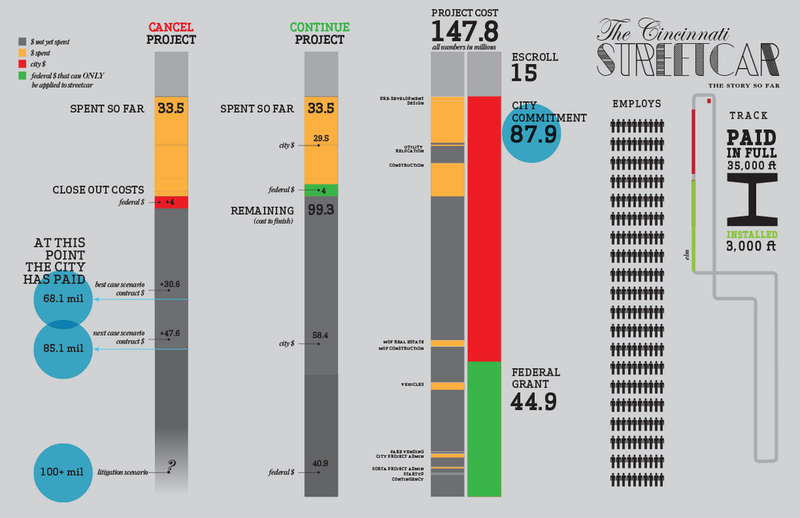 As City Council prepares to make a crucial vote on whether to “pause” or continue the streetcar project, designer Giacomo Ciminello compiled a visual of the costs for both pausing and continuing with the project. The initial estimate shows a $400,000 difference between the two options. However with one option, $147 million will result in a streetcar and the other option would leave taxpayers footing a $147 million cancellation bill to have nothing built. Council argues the $3-4 million annual operating costs of the streetcar rationalize their decision to spend the same amount of money to cancel the streetcar than to complete it, as they would be saving money in the long run. Earlier this week, project executives explained many options to pay for operating costs which would remove the burden from the city budget, and even allow the streetcar to operate “in the black,” turning a profit. The vote on “pausing” the streetcar will not only define Cincinnati’s view on progress, but also on fiscal responsibility. This entry was posted in Connect, Infographics, Project Update, Public Outreach and tagged budget, Cincinnati, city council, Infographic, Politics.